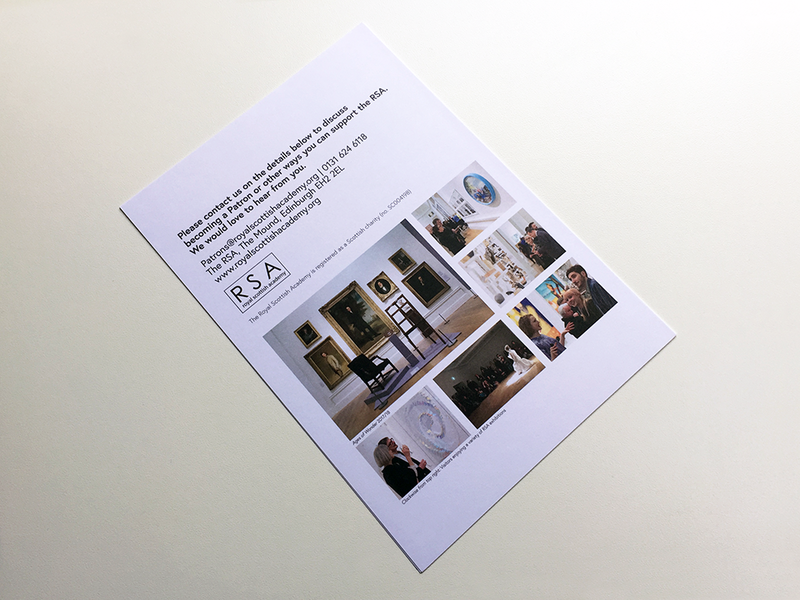 The Royal Scottish Academy asked me to design a brochure to launch a new Patrons scheme. 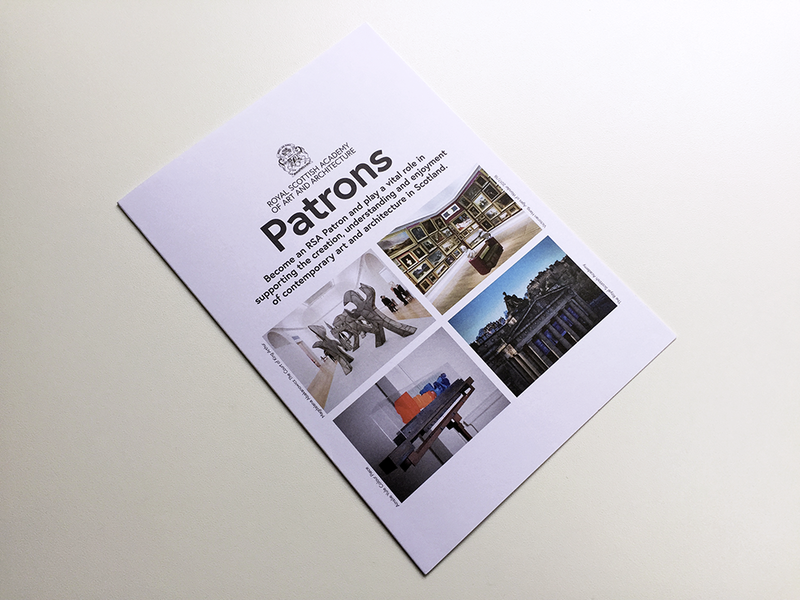 The Patrons scheme is distinct from the RSA Friends, an organisation I have previously designed materials for, in that it is a small exclusive group and will focus on building a relationship with the Academy and artists. The brief was to design materials that reflect this with a high quality look and feel. 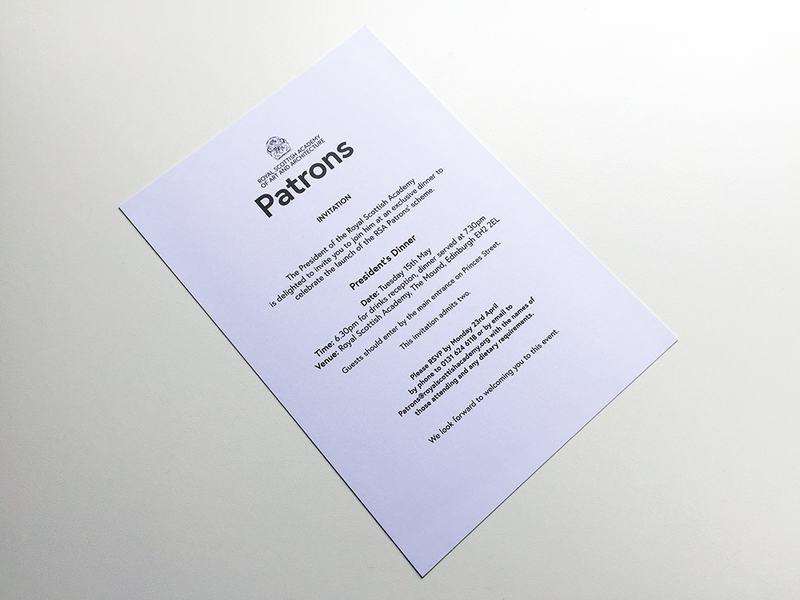 I designed a Patrons logo that incorporated the RSA shield and that is set in the typeface Europa in various tints of a rich black. The logo is always centred on the page with ‘Royal Scottish Academy of Art and Architecture’ set in uppercase giving a formal feel that is offset by having the word ‘Patron’ set in sentence case – if the logo had been set entirely in uppercase it would have felt too authoritative. The logo exploited the fact that Europa has, I feel, a split personality between its uppercase and lowercase letterforms: the lowercase letters have more warmth and character and a slight quirkiness that is not so apparent in the uppercase letters. 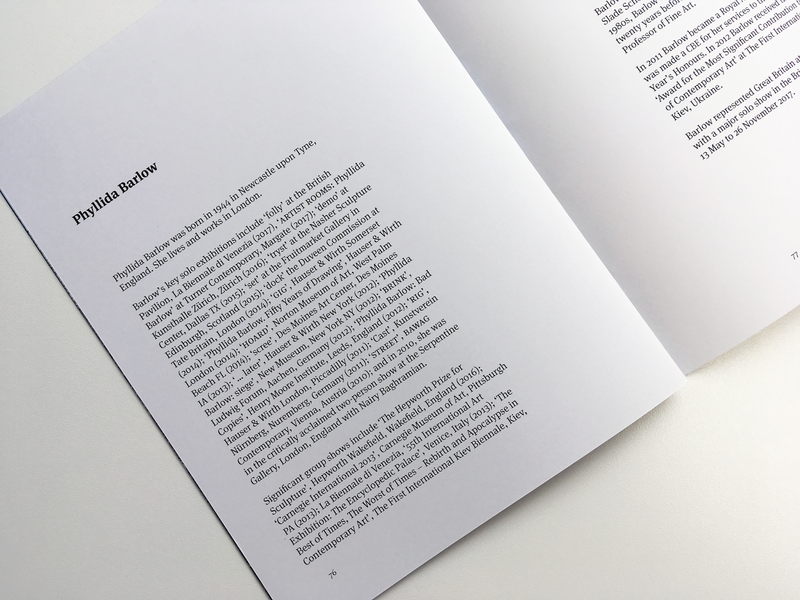 All other information in the brochure is ranged left with a ragged right, creating a tension with the logo and grounded by the placing of images within a strict grid. The RSA supplied a selection of images that, over a period of time, were edited, re-ordered and refined in collaboration with the RSA, to reflect the aspirations of the scheme. 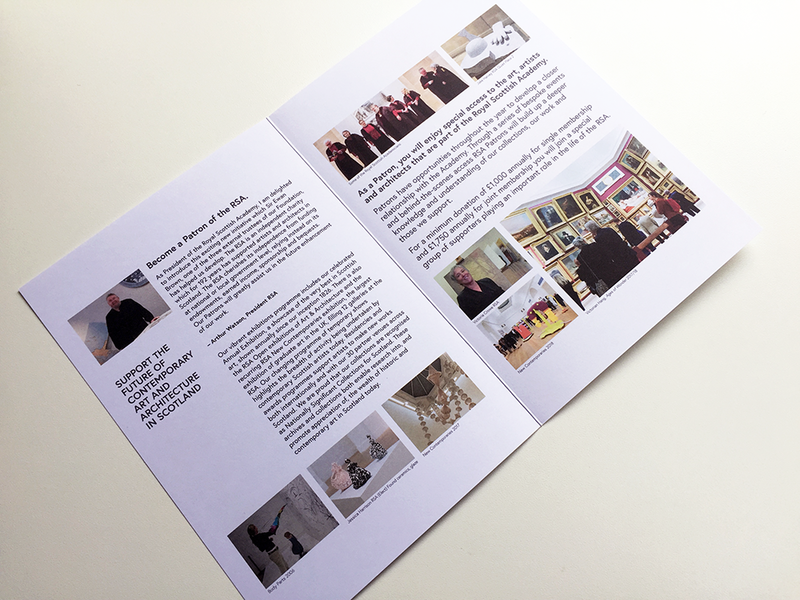 As well as the brochure, I also designed a membership card, a donors’ wall for the gallery, and an invitation to a dinner that launched the scheme. 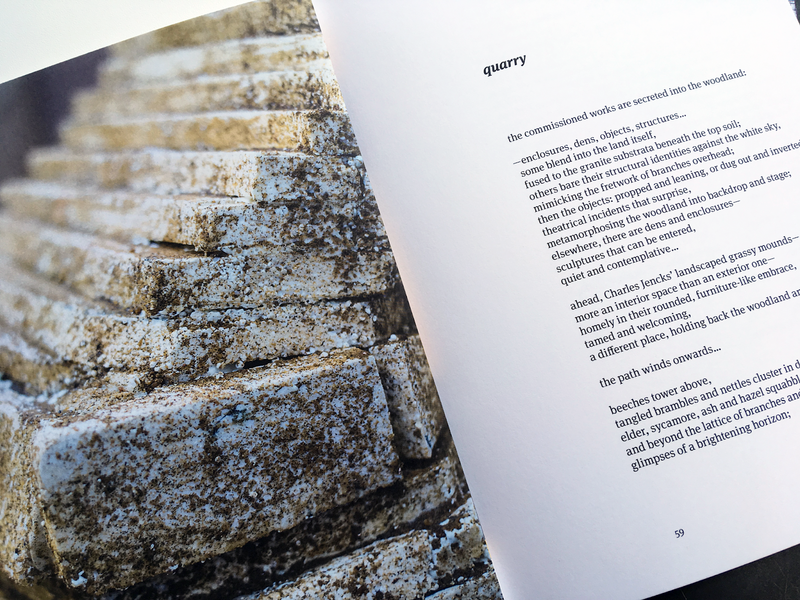 Here is another taster for Phyllida Barlow: quarry, a book that I have been designing with the artist and the team at Jupiter Artland. Commissioned by Nicky and Robert Wilson for the tenth anniversary of Jupiter Artland, quarry brings together three sculptural objects made from concrete and steel, each with Barlow’s signature textural surfaces. The text pages of the book are printed on Munken Lynx Smooth 150gsm, and the cover is quarter bound with a foil-blocked spine of blue Brillianta cloth with black head and tail bands and endpapers of Colorplan Real Grey. Here is a detail of the cover proof with a sample of Brillianta Blue 4014. The book has arrived from the printers and will be launched tonight when quarry will also be revealed to the public for the first time. Find out more about quarry and Jupiter Artland here. 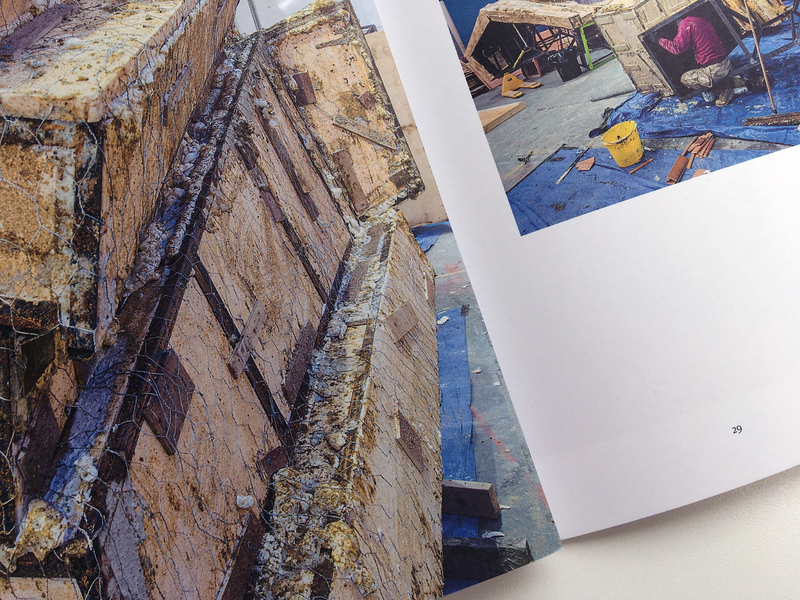 Here is a sneak preview of Phyllida Barlow: quarry, a book that I have been designing with the artist and the team at Jupiter Artland. Nestled in the woods of Jupiter Artland, quarry brings together three sculptural objects made from concrete and steel, each with Barlow’s signature textural surfaces. Quarry has been commissioned by Nicky and Robert Wilson for the tenth anniversary of Jupiter Artland, a sculpure park located in the 100 acre estate of Bonnington House, a Jacobean manor house, 25 minutes from Edinburgh city centre. It has been a pleasure to work on this publication which accompanies Phyllida Barlow’s first permanent outdoor commission; it includes an essay by Jo Applin and texts by Nicky Wilson and Phyllida Barlow, alongside a series of wonderful photographs that document the gestation of this remarkable work, by Allan Pollok-Morris, Anna Kunst, and Thierry Bal. The book is being printed by Gomer Press in Llandysul, west Wales: the book has been proofed and printed, and, ahead of binding, Gomer have sent me these running sheets of the text pages for a final check. 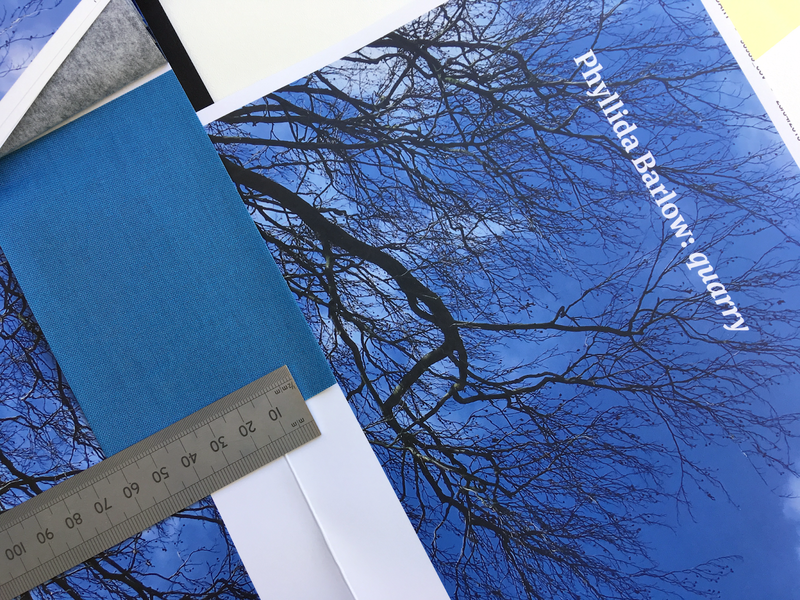 The text pages are printed on Munken Lynx Smooth 150gsm, and the cover will be quarter bound with a foil-blocked spine of blue Brillianta cloth with black head and tail bands and endpapers of Colorplan Real Grey. 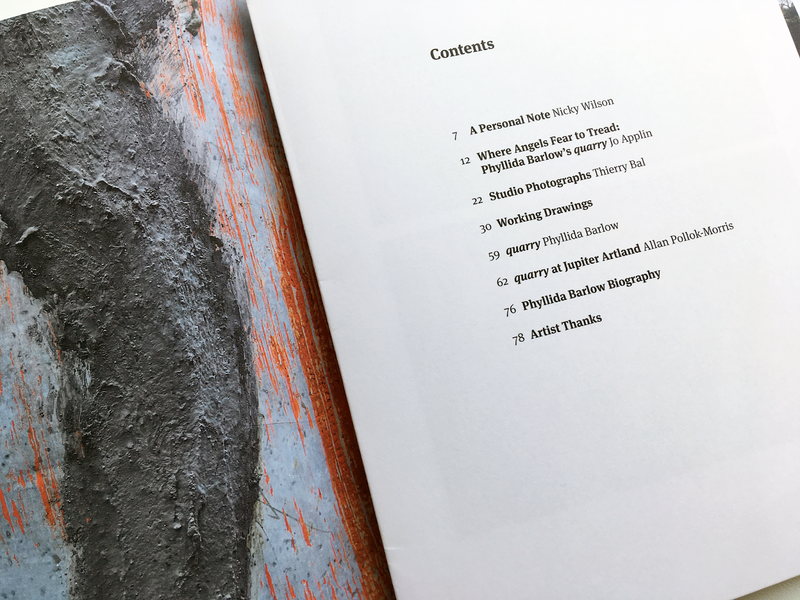 I’m very much looking forward to seeing the finished book – and seeing Phyllida's work at Jupiter Artland! It's been a busy week with a lot of waiting around for things to come back from the printers. 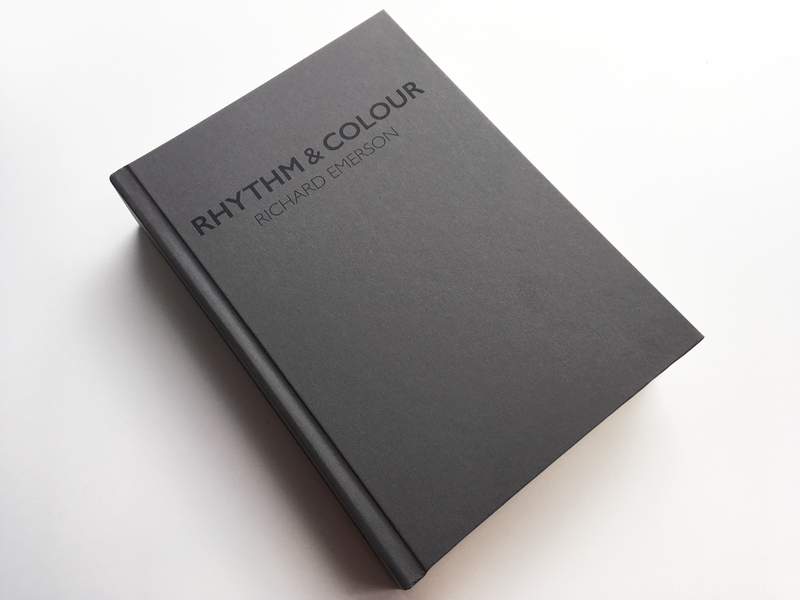 Allander brought round a test copy of Rhythm & Colour to check that the binding is correct. The book is being bound by Charles Letts & Co. in Dalkeith, a company famous for their diaries but also a specialist binder and finisher. 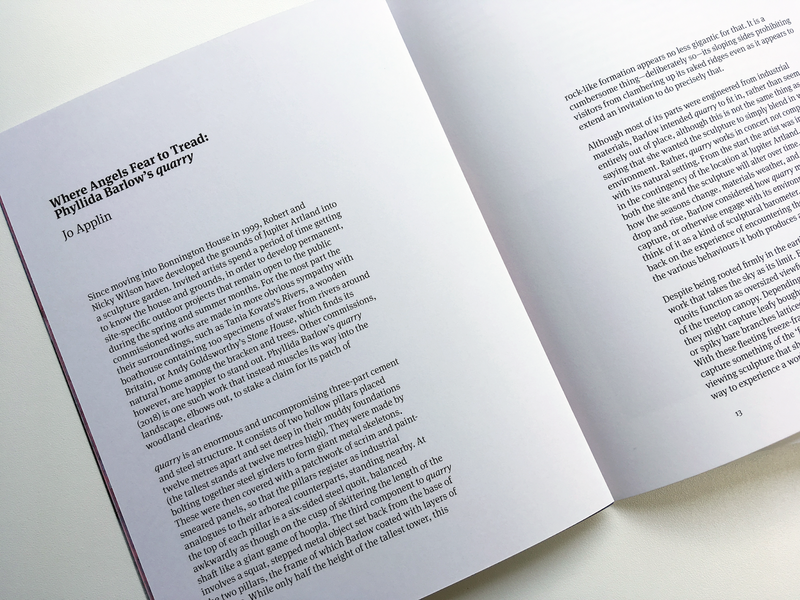 The text pages look fantastic: I am delighted with the paper, the print quality, and the flexibility of the binding – the book lays flat when opened. We made some adjustments to the cover, after which Letts made another test copy, which I signed off. I’m very happy with it. The dust jacket has not worked out as I expected: in order to have the UV spot gloss varnish that I originally planned, the dust jacket – which is printed on 150gsm Olin Regular Cream, an uncoated paper – needs to be sealed: the anti-scuff seal did not work and took away from the tactile quality of the paper. 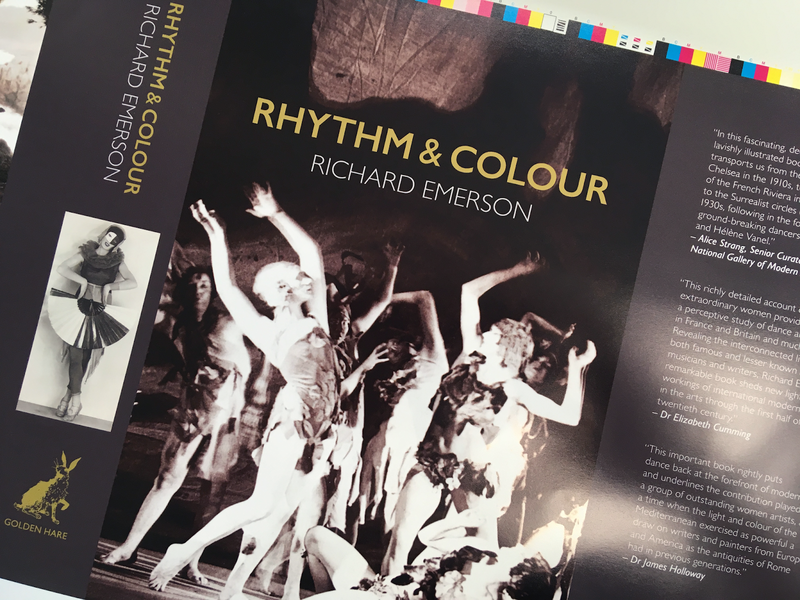 Luckily, last week, Allander had sent me some running sheets of the dust jacket to check the colour balance. I trimmed one of these sheets to size and wrapped it around the test copy of the book. I was much happier with the cover without a sealant or coating and although that means we cannot have a spot varnish as I planned, I think we gain more from keeping the natural quality of the paper that maintains the connection to the text pages which are printed on the same stock. 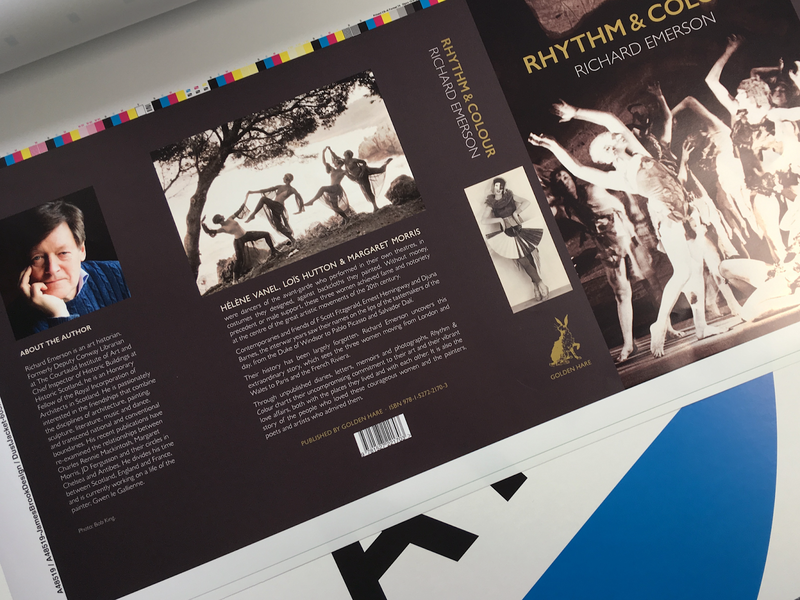 Allander are currently reprinting the dust jacket; once we have this, Letts will run some tests as they are concerned that the dust jacket may crack when folded. I've run some ʻtests’ here with the running sheets and, so far, no cracks, so fingers crossed that we are able to do this. Meanwhile, Rees & Co., the cultural communications agency that are promoting the book, have been pushing ahead with the press campaign, including a small article in the June issue of Harper’s Bazaar. I am also delighted to hear that the book will be distributed by Cornerhouse Publications in Manchester. 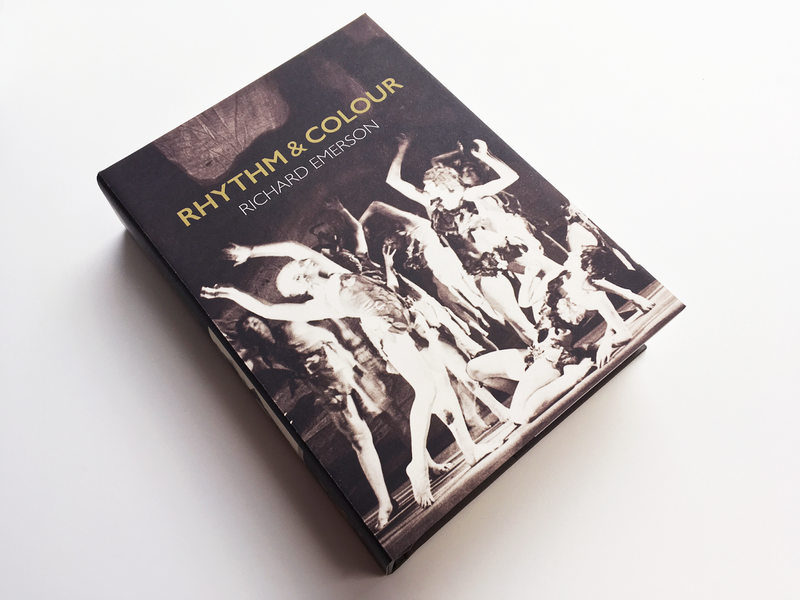 Here is the proof of the dust jacket for Rhythm & Colour. 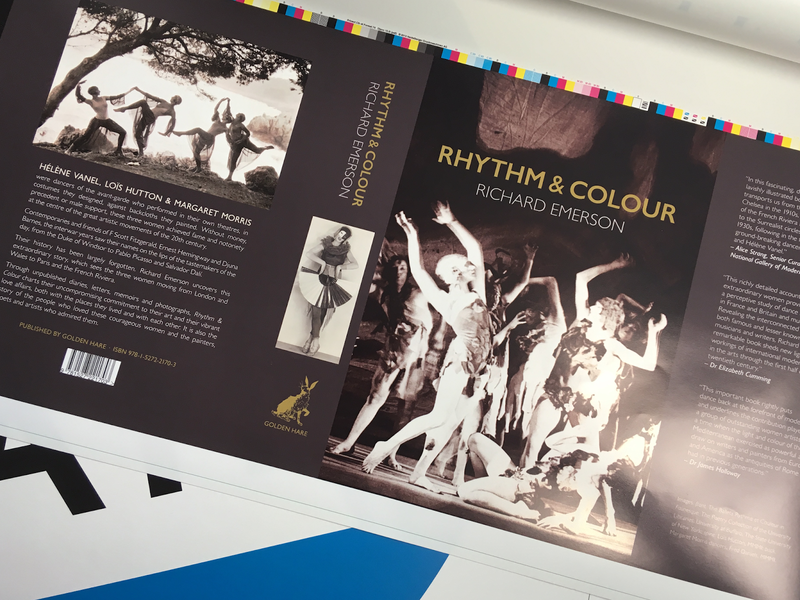 The book is being printed by Allander in Edinburgh and the dust jacket will be printed on 150gsm Olin Regular Cream with the title, author’s name, Golden Hare logo, and the images highlighted in a spot UV gloss varnish. The dust jacket will be wrapped around a cover of Keaycolor Sombre Grey 120gsm with the title, author’s name, and the Golden Hare logo printed in black. The endpapers will be printed to match the background colour of the dust jacket and finished with black head and tail bands. Very much looking forward to seeing the finished book!